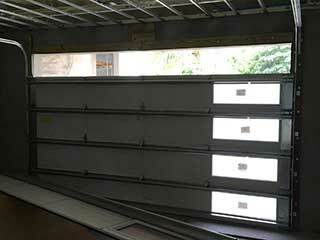 Garage doors might look like simple mechanisms, but all is not what it seems. Every year, thousands of people are taken by surprise due to an improperly maintained garage door, or hurt themselves trying to repair these surprisingly complicated devices themselves. Don’t put yourself at risk: leave it to the professionals! Door springs provide the tension needed to lift your heavy door off the ground, which means that a broken or misaligned spring can snap and whip around unpredictably. Even worse, a broken or loose safety cable could send your springs flying across the garage, or, across the street (!) Spring and cable repair and replacement is where the most accidents with attempted DIY repairs happen. Our technicians are trained professionals who know the ins and outs of this so leave them to handle these parts for you. Your garage door needs a smooth path to move along when opening and closing. If the vertical or horizontal tracks are cracked, dented, or warped, it's unlikely your door is going anywhere without causing or sustaining further damage. Straightening out, realigning, or replacing a track is deceptively complicated; even a tiny misalignment could leave your door struggling to move up and down. Worse, if one of these components does in fact get misaligned, you'll want to avoid the risk that the door gets off track completely. If this does happen, we're here to help. Just a quick realignment from one of our specialists, and your door should be running smoothly again. If your garage door is starting to show its age, or if you’re moving into a new place and want to make sure everything starts off on the right foot, our team offers diagnostic and maintenance services to prevent malfunctions from happening. With just one call, you can arrange to have your system fully safety tested, adjusted and lubricated by skilled technicians that will make sure nothing inconvenient–or dangerous–takes you by surprise one day. Whether you're experiencing problems with your opener, rollers or springs, contact Garage Door Repair Olympia to get it sorted out right away!